Ferrets Unlimited Rescue Services is having another Yard Sale! Shop for the ultimate bargains, best deals and even MORE hidden treasures! Featured items include a full aquarium setup, computer desk, electronics, books, albums, knick knacks, household items, clothing, stuffed animals, videocassettes, water cooler, jewelry and much more. All proceeds from the sale will support our rescue, a non profit 501(c)3 charity. Do you have unwanted household items and furniture? Did you have a garage sale and have unsold merchandise? Please consider making a donation to help FURS. Your tax-deductible donations will be helping us raise money to pay for veterinary care, food and supplies for the ferrets that have been rescued or surrendered to us. For more information about donations and to make arrangements to donate, please email us at diane@ferretsunlimited.org or call (216)502-2977. My husband and I love ferrets, a passion so great that he became a member of the board of directors at Ferrets Unlimited Rescue Services. A few months back we received an email from Crystal, FURS intake coordinator, regarding FURS latest rescue a tiny, malnourished, chocolate ferret. The woman handed him to Crystal in a large hamster ball and gave her the rest of his "food" a cheap bag of hamster seed. Crystal quietly took him from her and immediately rushed him to the vet's office. He was so weak and covered in fleas. His future did not look good due to anemia, from the fleas, and was so skinny he only weighed 15 oz. Crystal took this little baby home and cleaned him up and treated him for the flea infestation. It took two baths and hours of combing to remove all the fleas. I contacted Crystal and offered to foster this poor little one, as I knew his care was going to be extensive. Two days later he arrived at our home. As soon as I saw him my heart sank deep into my chest and I wondered HOW could someone neglect him so bad. I knew from the moment I held his limp little body in my arms he belonged here with us, that he would not be just a foster but had already found his forever home. He could not walk or stand and needed to be syringe fed, as he was so weak he could not eat or drink on his own. I saw in his sunken eyes that he had the will to live. I fed him every two hours for the first week and after 4 days he was able to stand on his own. He was very shaky but was standing. He gained 6 1/2 ounces that first week. Within two weeks he was walking and eating on his own. Each passing day he became stronger. Three months later he is a very happy and healthy ferret weighing in at 2 pounds 10 1/2 ounces. We named him Patch because of the white patches on his knees, but is also known as mama's little man. He is the happiest ferret I have ever meet dooking non-stop. He loves to go outside to play and is discovering all kinds of new toys. He is now getting to know his brothers and sisters too. In June, Patch got the honor of being Ferret of the Month at ferret.com's forum. We are forever grateful to Crystal, without whom he would have died a very painful death. Patch will never have to again endure a life of going without food or love. If you have ever considered becoming a foster or adoptive "ferrent" (ferret parent) PLEASE do so as the rewards are beyond words. Here's an update on our ferrets from the June 12 Parma Heights Ferret Rescue that we told you about back in June. We took one of the ferrets, Pinkie, to the vet immediately, where he underwent emergency surgery to remove 7 teeth and 2 cysts. He is recovering nicely. He is also blind. Another rescued ferret, Panda Bear, will undergo dental and adrenal surgery on July 17, at which time both he and Pinkie will go into foster care. The other two Parma Heights rescue ferrets in our care, Big Red and D.Q., are beautiful, healthy, active (not to mention mellow and affectionate) male ferrets, about 2 years old. They are in foster care and are now available for adoption. Ferrets Unlimited also received a call from a local animal control officer the same day as the Parma Heights rescue regarding a ferret that was brought in to them. Jake is a gorgeous, healthy sable ferret who will soon be looking for a forever home. We welcome any contributions toward the care of these babies, as well as your interest in adopting Big Red, D.Q., and Jake! Donations can be sent via PayPal or checks can be sent to Ferrets Unlimited Rescue Services, P. O. Box 44012, Cleveland, OH 44144. We are a 501(c)(3) charity, so your donations are tax deductible. Please feel free to spread the word and crosspost this update. 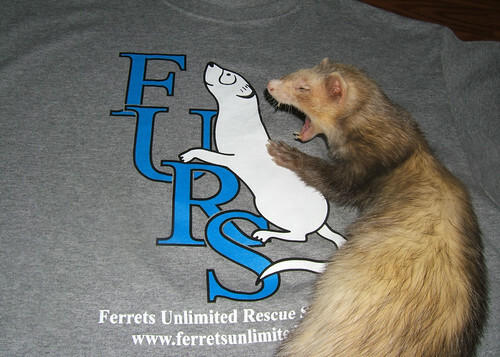 Help Ferrets Unlimited Rescue Services win a $20,000 grant! Help us win! All you have to do is click to help rescued animals, and then vote in The Animal Rescue Site $100,000 Shelter+ Challenge. Both of these actions are absolutely free! You can vote once a day, every day, until July 26, 2009. Every time you vote, or tell a friend to vote, you are making a huge difference for us. We have had a large number of ferrets surrendered recently and this an easy to help us, without spending a dime. Just visit the Shelter+ Challenge page and enter Ferrets Unlimited Rescue Services in the purple box under Search and Vote for a Shelter and click the Search button. Then you will see Ferrets Unlimited Rescue Services and a button to Vote for us. You may vote once a day! I'm Donating My Birthday to Charity! Every year, my friends and family try to decide what to give me for my birthday and while I always appreciate the gifts and the fact that they are thinking of me, this year I want to do something special. Volunteering and donating to charity is my passion and the ferrets need our help more than I need gifts. 45 is a milestone birthday and it would mean so much to me to inspire people to donate to charity for my 45th birthday. Facebook makes it easy to donate your birthday to charity. I will be 45 on July 14, 2009 and I have decided to donate my 45th birthday to charity. I am encouraging everyone to make a donation to Ferrets Unlimited rather than giving me a gift. Some of my friends and family have already donated to my birthday wish on Facebook! Please visit my birthday wish to see my progress! If you are not on Facebook, but still wish to make a donation in honor of my birthday, you may make a donation via check or Paypal, instead. Please include a note that this is for my birthday wish. Times are tough, so another way to grant my birthday wish, is to create a charity lens at Squidoo, and donate the proceeds to charity. Squidoo is easy and free and it's a great way to donate to Ferrets Unlimited and many other charities, by choosing to give all or a portion of your proceeds to the charity of your choice. I have many Squidoo lenses that benefit Ferrets Unlimited. It's a fun way for me to create web pages, while helping charities at the same time. Visit My Birthday Wish lens at Squidoo to create your own lens, and see the sweet charity lens that Bambi created in honor of my birthday (and the ferrets). Thanks to all of you that support Ferrets Unlimited with your time, your donations, by providing homes, and by spreading the word. Just knowing that other people care about the ferrets is the best gift I can think of. Ferrets Unlimited has a page on Facebook at Facebook.com/FerretsUnlimited. If you are on Facebook, please stop by and say hello! Our new logo T-Shirts are available for sale on our website! We have crew neck shirts in black, oxford gray, navy, or red in sizes from adult small to XL. The shirts are only $16 each and U.S. Shipping is FREE.